IFA: Pure reveals new One radios, plus Evoke and Siesta models | What Hi-Fi? The new Pure radios reflect the growing popularity of streaming services and wireless music, with features including Bluetooth and Spotify Connect. The new One family - the third-generation of "the world's best-selling digital radio range" - has three models, the One Mini, One Midi and One Maxi. We'd imagine the key difference is going to be the size. 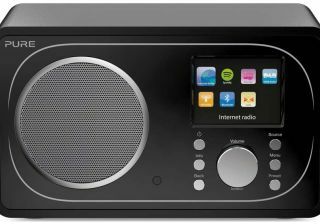 If you want an Internet radio with a few more features, the Evoke F3 (pictured) may be more up your street. Yours for £130, it has Bluetooth and Spotify Connect as well as 25,000+ internet radio stations. More new table-top radios come in the shape of the Evoke C range. Again, there are three models, the Evoke C-D4, C-D6 and C-F6, offering "a range of audio options", including DAB, FM and internet radio, Bluetooth and even CD playback. Last but not least is the Siesta Rise. You miight have guessed from the name this is aimed at your bedside, and as well as a various sleep and alarm functions, it includes a USB charging port for smartphones.